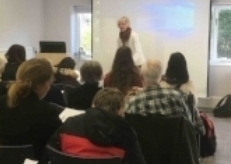 This is an extract from the beginning of Professor Claire Davison’s talk, given at Lucy Cavendish College on 29 November 2017 to an audience of 50 from town and gown. Our warmest thanks to her Claire a fascinating lecture and discussion. The talk was introduced by a short extract from the Overture to Ethel Smyth’s opera The Wreckers, in a recording from 1911 conducted by Smyth herself. Woolf’s oft-quoted letter to Smyth, with its evocative, idiosyncratic cameo portrait of the composer, shows the powerful inspiration of a new friend, whom Woolf would describe in somewhat punchier terms six months later as being ‘of the race of pioneers, of path makers, […] who has gone before and felled trees and blasted rocks and built bridges and thus made a way for all those who come after her.’ (1) The quotation is also one of the very rare instances of a minor editorial oversight in the Letters of Virginia Woolf: there is no footnote contextualising the event, which was most likely a concert of Smyth’s music at Mansion House, London. (2) The repertoire that evening included her overture to The Wreckers, Spring Canticle and the Anacreontic Ode. Such details matter. They suggest that the miraculous pink flushed rose in the spiky, burning hedge may be less a dazzling and rather daring metaphor than a transposition of a very vividly recalled scene: that of the impassioned, conductor energetically directing the ring of musicians performing around her. • what I refer to as ‘Singing Songs of Sixpence’ in Three Guineas. (1) Virginia Woolf, ‘Speech before the London/National Society for Women’s Service, 21 January 1931’, in The Pargiters by Virgina Woolf: The Novel Essay Portion of the Years, ed. Mitchell Leaska (Hogarth Press, 1977), pp. xxvii-xxviii. 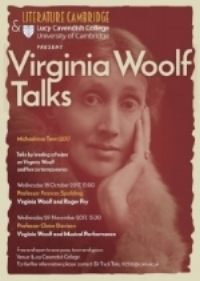 (3) See in particular Emma Sutton’s outstanding monograph, Virginia Woolf and Classical Music (Edinburgh University Press, 2013), and also Adriana Varga’s edited collection, Virginia Woolf and Music (Indiana University Press, 2014). (4) Ethel Smyth, ‘Where Musical Criticism Goes Astray’, Female Pipings in Eden (London: Peter Davies, 1933), pp. 71-86. (5) See in particular Oliver Sach’s Musicophilia: Tales of Music and the Brain (Knopf, 2007).